Similar to functionality already available with platforms like music streaming service Spotify, it’s now possible to turn your personal Instagram account into an elaborate ad for Netflix content. Directly through the Netflix app’s ‘Share’ button it’s now possible to post a movie or television show’s artwork directly to your Instagram Story. Standard Instagram Story features, such as adding text or GIFs to an image still work as well. 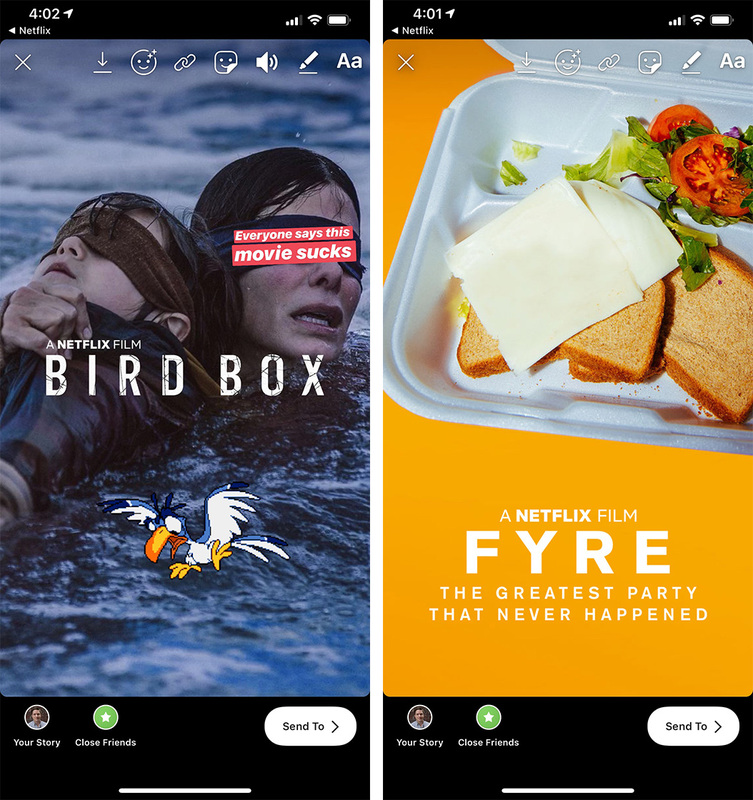 I tested out the feature with two recently released Netflix movies, Fyre: The Greatest Party That Never Happened and Bird Box. Both stories shared directly from the Netflix app featured thumbnail art pulled directly from Netflix’s user interface. There’s also a link at the top of the story that says ‘Open Netflix,’ allowing those that follow you to navigate directly to the TV show or movie you’re sharing. Netflix says that Share integration is first launching on iOS before making its way to Android in the near future. I find myself using Share integration with Spotify quite frequently but I’m not sure the situation will be the same with Netflix. That said, it would be fun to troll my followers with my downright horrible taste in trashy reality TV. From Netflix’s perspective, the partnership makes a significant amount of sense. After all, Instagram users posting Netflix content to their “Stories’ is great free advertising for the streaming giant.